If you didn’t know the “rioja” in “La Rioja” actually translates to wine in English. And since I’m in Wine Country this post was bound to happen because I finally went to a winery! 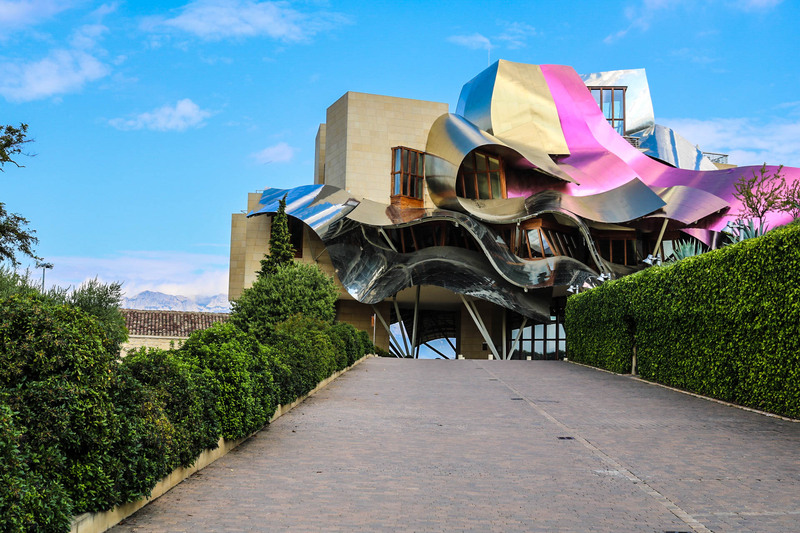 Marques de Riscal in El Ciego is one of the many wineries (here they are called bodegas) that you can visit in La Rioja. From Haro to La Guardia there are many options and they aren’t very expensive. The hotel is stunning and was created by the same artist who designed the Guggenheim in Bilbao. The bus ride from Logroño is no more than 30 minutes and was less than 4 euros roundtrip. My friends and I packed some snacks, met at the bus stop and were on our way. We got a full tour of the winery (not the hotel) and learned about the entire process. The wine smell was so potent and the grapes were such a dark purple that I’ve only seen here in Logroño. My Spanish skills were tested because the tour was entirely in Spanish. I had to pay more attention to the tour guide, but I understood most of the process fairly well. It was interesting to see how a machine can decipher the good grapes from the bad grapes and separate the grapes from the vine. That aspect is machine run, but there are many people in charge of manning them who then oversee the fermentation process. At the end we tried two wines: one white and one red. I preferred the white because the red was strong and very dry, but I will drink both again because I bought two bottles for only 8 euros! I want to take them home and share with my friends and family (and pretend I know all there is to know about wine). I enjoyed being able to relax and learn something new in a pueblo I would have never gone to before. El Ciego had an excellent view of the mountains. I look forward to visiting more wineries as the year progresses! Thanks for reading! PIN this post for all the wine lovers!